“Too many people overlook their coffee machine during their spring cleaning regime or use the wrong products,” says Kofi Amoako, Technical Director of Full Circle at Urnex. With Spring nearly upon us, Full Circle introduces an eco-friendly way to "spring clean" your coffee machine - a key factor in creating the best home brew possible. The days are getting longer, and the approach of daylight savings time signals it’s time to start thinking about spring cleaning and other routines to welcome the new season. Replace batteries in the smoke alarm: check. Change filters in the air conditioner: check. Clean the coffee and espresso maker? Check! 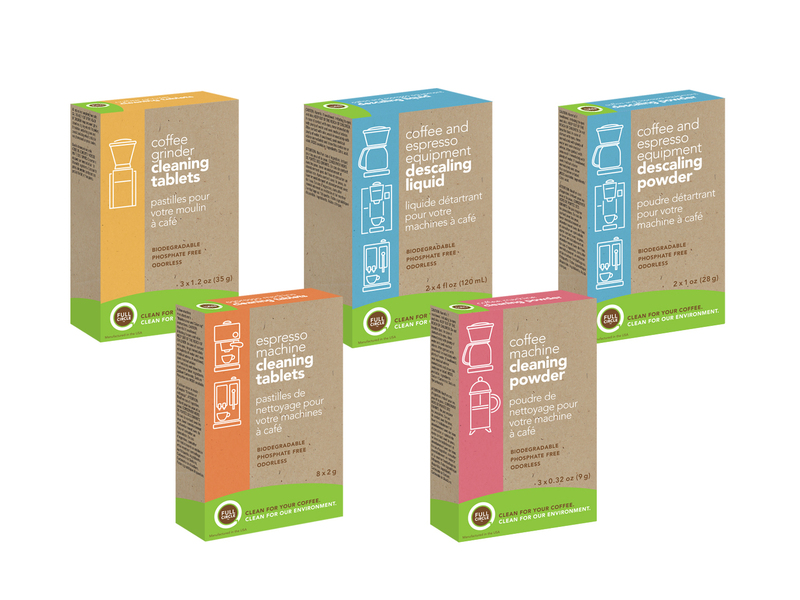 Now, anyone who brews coffee at home can easily cross this often neglected job off of their "to do" list in just a few moments, thanks to Full Circle’s complete line of environmentally conscious cleaning products. “Too many people overlook their coffee machine during their spring cleaning regime or use the wrong products,” says Kofi Amoako, Technical Director of Full Circle at Urnex. According to the National Coffee Association 2011 report, at home consumption of coffee is up: over 50% of all adults drink coffee and, of those, 85% report they prepare coffee at home. That means there are a significant number of people who may not grasp the importance of putting “Clean the coffee and espresso maker” on their spring cleaning list. Devoted coffee enthusiasts take pride in knowing how to brew a perfect cup of coffee or espresso. They buy gourmet beans, which they grind themselves. They own top-of-the-line coffee and espresso makers. But, these same well-informed coffee lovers may be unpleasantly surprised to learn that coffee maker reservoirs ranked as the fifth germiest item in the home today (May 2011 NSF International study, “Germiest Places in the Home”). Those who savor a consistently great cup of coffee will appreciate the convenience of using the Full Circle products that clean coffee and espresso equipment in the same amount of time it takes to brew or grind a cup of coffee. But, the benefits of these products extend far beyond simplicity of use during spring cleaning time. Williams-Sonoma offers Full Circle coffee and espresso cleaning products to customers at their retail and e-commerce locations nationwide. The line of environmentally conscious Full Circle products was developed by Urnex Brands, respected cleaning experts in the commercial specialty coffee market since 1936. For more information about Full Circle coffee and espresso equipment-cleaning products, please email info(at)urnex(dot)com; visit Full Circle Coffee Cleaners on Facebook or http://www.williams-sonoma.com or shop nationwide at Williams-Sonoma retail outlets. Urnex Brands, the creator of Full Circle cleaning products, has been the authority in coffee equipment cleaning since 1936. The company’s full portfolio of coffee equipment cleaners is the result of years of innovation in creating products that meet the highest standards for cleaning power while maintaining a commitment to transparency and the use of environmentally safe ingredients.